Biodiesel (B100) is a renewable product derived from processing (transesterification) agricultural oils, recycled cooking oil and animal fats into Fatty Acid Methyl Esters (FAME). 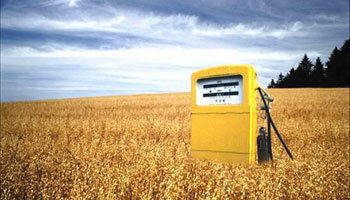 Biodiesel that meets an established quality specification (ASTM D6751) may be used as a blend component in diesel fuel. Up to 20% by volume biodiesel may be added to diesel fuel, the final blend of which is identified by the letter “B” followed by the percentage biodiesel in the final blend, such as B20, which contains 20% by volume biodiesel and 80% by volume diesel fuel. Ethanol is a renewable fuel made from various plant materials collectively known as “biomass.” More than 95% of U.S. gasoline contains ethanol, typically E10 (10% ethanol, 90% gasoline), to oxygenate the fuel and reduce air pollution.